Another pleasant day of driving before we cross one last mountain range. Walking in the mountains is the essence of life itself, but driving in them is a drag after the spectacular-vista glow wears off. I was driving into the morning sun across Arkansas so the photographic opportunities were scant. A shame because passing through the low hills of the southern Ozark Mountains as the fog burns off is a visual treat. The countryside of Arkansas and Tennessee is downright charming, though the I-40 drive can get a little hairy if you hit Memphis or Nashville at rush hour. We timed it about perfect, hitting both before the traffic went nuts. 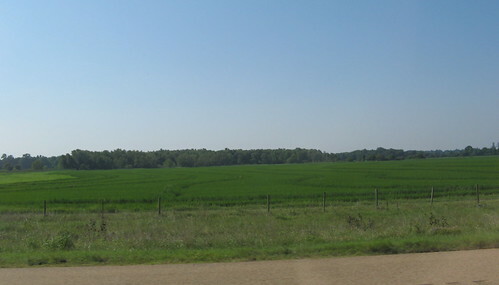 Something very green grows in an Arkansas farm field. 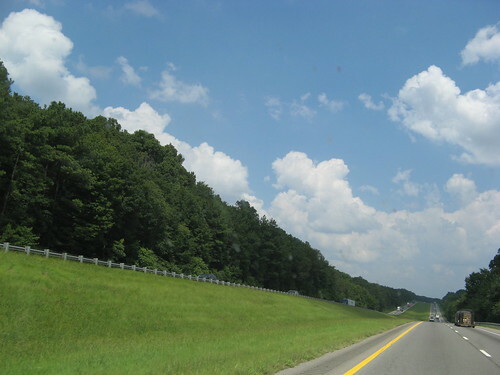 The section from Fort Smith to Little Rock is all rolling hills, but the land flattens out east of Little Rock. 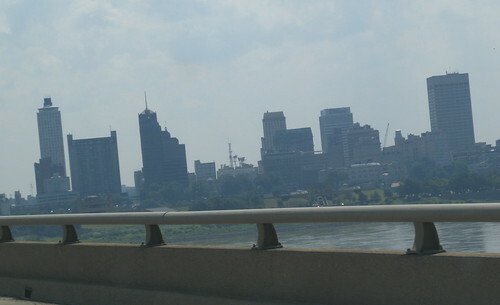 Crossing the Mississippi into Memphis, cradle of Rock ‘n’ Roll (and, to its eternal regret, the city where Martin Luther King was assassinated.) My aunt Vivian says she was born 60 miles north of here. Not bad for somebody trying to drive and shoot and avoid causing a 17-car pileup. 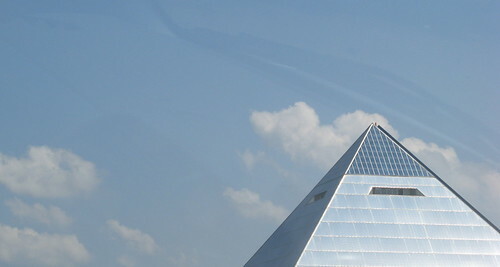 Memphis has a shiny pyramid. I can’t say why. Off to Nashville. 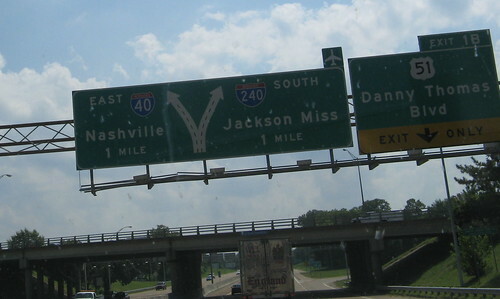 Later I wished I’d remembered to look for a “Highway 61” sign, the famous route down into Mississippi. Wonderful country along this way. Must’ve been a hundred signs pointing to stuff I wanted to check out — state parks, battlefields, Loretta Lynn’s dude ranch. 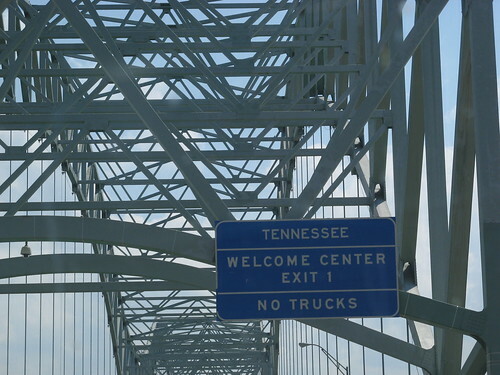 A guy with a canoe could paddle his life away on all the rivers I-40 crosses. 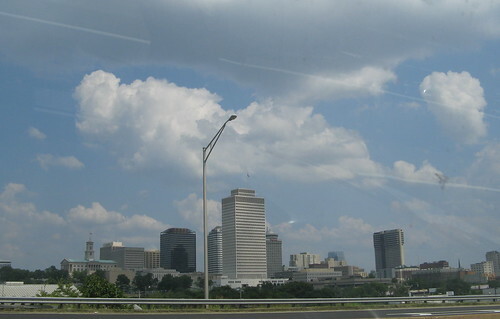 A lame shot of Nashville’s excellent skyline. Could’ve gotten a better shot but figured I had pressed my luck too far with all the driving and picture-taking. Tomorrow: Across the Smoky Mountains and on to point of this expedition. Have to say, been enjoying the cross country trip. 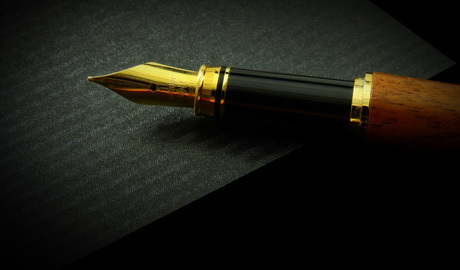 I just wish you could have stopped along the way and written more about some of the places you mention. What an adventure. I’m enjoying the virtual road trip with you, Tom. Parts of the country I’ve never seen…yet. Looking forward to your Smoky Mountains posts tomorrow. Drive safely! The pyramid is the old arena in Memphis, named “the Pyramid”. Pyramid, eh? Check out the original Memphis, along the Nile in Egypt.